Dumbleyung and West Australian trucking pioneer Brian Bracknell is indicative of the spirit and commitment truck drivers give to improve the standards of their industry and service to their customers. .
’Bracky’ as he is affectionately known locally, hauled the first load of cattle from Kimbolton Station to Perth, a distance of 2600kms and from that day on he dedicated himself to the road transport industry and in particular to the livestock transport sector of the industry. His most famous load was Donald Campbell’s speedboat Bluebird. In 1964, Campbell set a land speed record of 403.1 mph (648.73 km/ph) on Lake Eyre in South Australia, and headed to Lake Dumbleyung in a bid to set a new record on water in the same year. Bracky was the Ampol fuel agent in Dumbleyung. He took fuel to the lakeside camp where Campbell’s team was based and was among the select few allowed to the water’s edge when the boat was being prepared for a run. Bracky still has great memories of that time and meeting the Campbells and their crew. After the record breaking run in Dumbleyung, Bracky then transported Bluebird up to Perth, on its celebration tour along the Great Southern Highway. 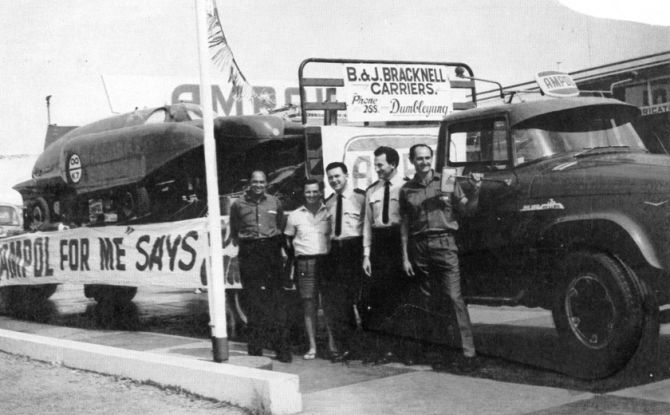 As Ampol was the major sponsor of the Bluebird campaign, they stopped at every Ampol service station along the way, some he recalls ‘for a good feed’. Bluebird had a celebration run on the Swan River in January 1965 before Bracky took Bluebird to Kalgoorlie to be put on an interstate train. In 1993, the quiet achiever from Dumbleyung used his road train on another historic run between Bedfordale (WA) and the nearby superphosphate works with a fifty ton payload. Under supervision of the Main Roads Department Bracky’s rig was the first road train to legally travel that route clearing the way for increased productivity. The Livestock Transporters Association WA had applied to the Main Roads Department to operate road trains from the southern Albany Highway direct to the CSBP works by-passing the Bedfordale road train terminal and until Bracky’s trial trip was not convinced it was either safe or practical. In 1987 Bracky, known as one of the industry’s true gentlemen, was awarded a Life Membership of the Livestock Transporters Association in honour of his long and significant contribution to the organization including being its inaugural president. In 1999 he won the BP Professional Driver of the Year Award for his impeccable driving career. Bracky has now retired but still works hard for the industry with a focus on young drivers and industry road safety issues. Source: Road Transport Hall of Fame. All the best for a speedy recovery Bracky. Brian is doing well in Royal Perth Hospital after having a tumour remove in the lower leg. The surgeon was able to save the leg and foot. Brian is in recovery/rehab and we don’t know how long this will take or when he will be home. It is truly amazing that there are some real life legends out there on the roads like Brackey. Admiring commitment he put into serving. It will help and inspire a lot of truck drivers adhere to these to improve and be more effective for the community. Great read!